Heat oven 350°F (325°F for dark or nonstick pan). Place paper baking cup in each of 24 regular-size muffin cups. Make and bake cake mix as directed on box for 24 cupcakes. Cool in pans 10 minutes; remove from pans to cooling rack. Cool completely, about 30 minutes. Remove paper baking cups; cut off rounded tops of cupcakes. To assemble each bride cake, place 1 cupcake, cut side down, on individual serving plate. Spread cupcake bottom with 1 teaspoon frosting. Place another cupcake, cut side down, on top of frosted cupcake. 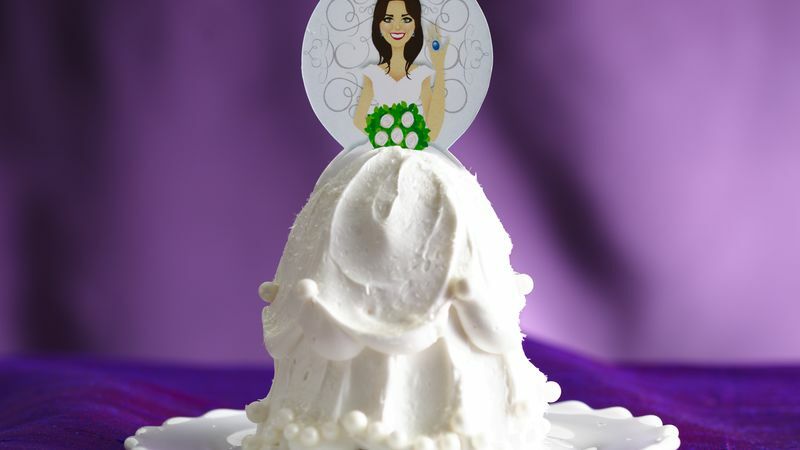 Spread frosting over stacked cupcake with downward strokes to make ruffled skirt. Add decorations to skirt if desired. Insert bride pick in top of frosted cupcake to complete princess. Continue with remaining cupcakes and frosting, making a total of 12 bride cakes. Store loosely covered. Add a glimmering touch to the princess wedding dress by sprinkling with edible glitter. Edible glitter comes in a variety of colors and is available at craft stores.